As we flew into Abu Dhabi on our way to Nepal, I got a new appreciation for the size and breadth of our planet. We went from Cincinnati to Chicago, then from Chicago to Abu Dhabi. How we travelled there was unexpected. The flight went northeast through Canada, across the northern Atlantic north of Scotland, then entering Eastern Europe through Turkey, Iraq, and the Persian Gulf. 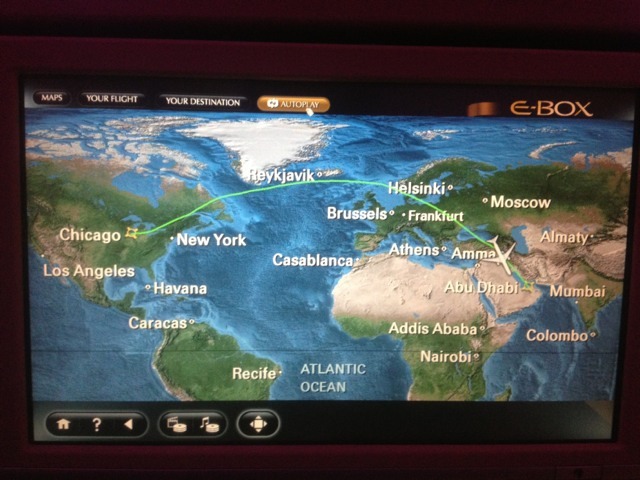 Crazy route, but really cool to see on the map displayed on our in flight screens. Oh and by the way, Etihad Airlines has outclassed any airline I have ever been on. Best I’ve ever seen and I was on the plane for almost 13 hours today. I’m thankful for a big planet of many people of many ethnicities. So many people, so many to reach with the gospel of Jesus Christ. However as people are reached, I look forward to the day when every tribe and tongue will praise Christ!